1) Create a nice inside space for photos for the few times a year it is pouring down rain in Southern California like it has all day today. 3) Learn Photoshop. I have it just need to learn how to use it. 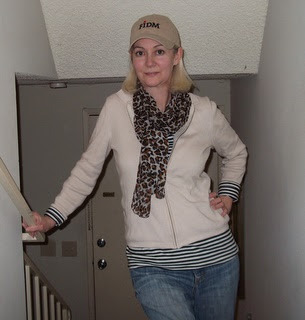 5) Figure out how to do casual without wearing jeans every day. 6) And of course, be a better friend to fellow bloggers by letting them know how much I appreciate them. I went to campus today for several more hours of trying to finish up this crazy quarter-it's not just me in the weeds btw (if you ever waited tables you know what "in the weeds" means) Only one half-decent picture without my awesome in-house photographer. You just reminded me that I wasn't following you, OOPSZ! Also, my 'casual without jeans' look is easily a tshirt dress... I often make these myself based on a 'Built By Wendy' Sew U Stretch pattern, and they're easily gorgeous but feel like tracksuit pants! I find this hard to believe, but I just discovered I wasn't officially following you either! Embarassing!!! Well, that has been remedied. A t-shirt dress is a good idea but I'm still gonna have to figure me out some pants.